I'm in love with the stacks of 13+14 marquee entries, and given the constraints they laid on the rest of the grid, I'm really happy with the pop and cleanliness of the rest of the answers. KEG STAND! WOOKIEES! OLD FLAME! (My college experience?!) Hopefully there are fun answers to discover in every quadrant. I like writing clues that tie into one another in ways beyond traditional cross-referencing. I think this is pretty in print — I like the look of the streak of clues that reads "Rushed, Rush, Red ___, Red ___" — but it's interesting to note that many, many solvers do the crossword digitally now, where that kind of maneuver has less aesthetic cache. Something for me to unlearn, perhaps. Generally, I thought this one wasn't edited as well as usual. You'll note that ironically, GLORIA STEINEM and WHITE PRIVILEGE are (precisely? nearly?) the only woman and person of color, respectively, in the puzzle. If memory serves, the original clues for at least MARC, STIR (either Tribe or Marley), HAJI, SAD, and SHRINE explicitly brought something, uh, deliberately un-Tom-Thumb-y to the cultural table. Even the clues for SHAD (kohada!) and PRUNE (tzimmes!) drew from milieus inferrable to Times solvers but more interesting, to me, than definitional clues, which this puzzle didn't lack. Strangely, the already-long clues for HOT TAKE and OTT were padded, to the point of clunkiness. Shout out to my favorite poetry professor in college, Darren Angle, who had us read Matthea Harvey's "SAD Little Breathing Machine," a book of poems that's stayed with me for many years since. And shout out to Will and Joel for writing an amazing VIRTUAL REALITY clue! GLORIA STEINEM and WHITE PRIVILEGE headline today's puzzle. 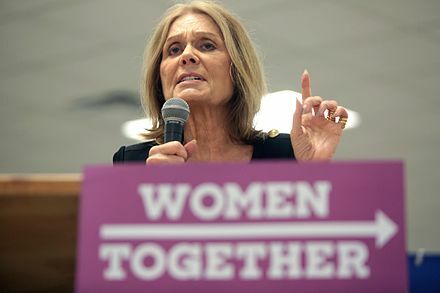 I enjoyed piecing together a historic figure in GLORIA STEINEM. But WHITE PRIVILEGE … although I think it's an important concept more people ought to learn about, I wonder if some solvers will feel like the puzzle is trying to shame them. I wonder how I'd feel if I were white. I liked the additions up top, WOOKIEES (yes, it's two Es, weird!) and ALT POP some nice bonuses. Not a fan of EFT ( a term for a juvenile newt) and LOT I, though. Overall, a wide mix of entries I found entertaining — DRAMEDY, KEG STAND, VIRTUAL REALITY, OLD FLAME, OPEN WIDE, THE NERVE — along with some that didn't resonate with me. Not watching many cartoons these days, ADVENTURE TIME didn't do much for me, and although HOT TAKE is an interesting new term I didn't know, having to work so hard to piece it together wasn't super satisfying. The level of crossword glue was just at my threshold. Along with the aforementioned, there was EME, OTT, and VAS. Thankfully these are all shorties and individually easy to overlook, especially since Natan did a nice job spreading them all out. But everything taken as a whole, I did feel like it was on the verge. The Biblical ARK had a "double standard" — two by two! Cool trivia that APHIDs are born pregnant. Neat biological advantage. Bows may be made in a SHRINE … not ribbon bows, but bows at the waist. [Lover of history?] is a great misdirection for OLD FLAME — a lover from one's personal history. TRAY is something someone may be holding when waiting … waiting on a table! [Soap box?] confused me, even after uncovering every letter. Ah, a TV SET is a type of box that plays soap (operas). Very nice. So many clever clues! Wish all Saturday puzzles had this many. Average word length: 5.31, Scrabble score: 305, Scrabble average: 1.64.